Originally a dockers pub, in the days when your author's grandfather often pitched up in the area with the Merchant Navy, the Grapes, in Narrow Street, Limehouse, was probably built as early as 1720 and is still well regarded amongst pub fans. In recent years the regeneration of the surrounding area has opened the pub up to an altogether different crowd, but this is proof, if it were needed, that Docklands does have some decent pubs. The pub previously sold beer from the neighbouring Taylor and Walker Brewery, and survived the extensive bombing of the docklands, and nearby Limehouse Basin in the Second World War. This is one of London's best and most pleasant riverside pubs; my only advice (nay, pleading) would be please don't go there if you are a total c*ck; many times I have been here and had a wonderful time in a friendly atmosphere. Last time I was there though a very loud, rude and obnoxious Canary Wharf type was occupying the terrace and the whole of the back bar with his friends as if he owned the place. 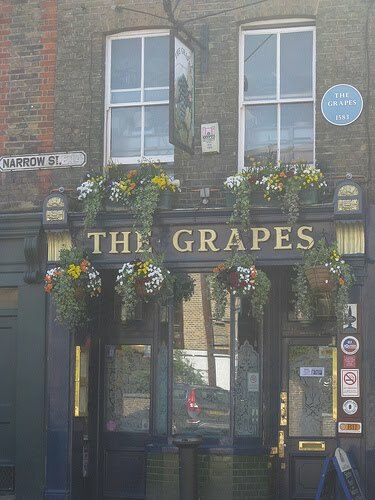 I know you can't pick who you choose to drink with in a public house, but it would be very sad if this is atmospheric little gem became a banker's bar.